Virginia Strawberry. 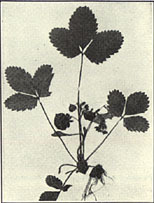 Fragaria virginiana Duchesne. This wild form of strawberry is found in dry soils from Newfoundland to South Dakota, Florida, and Oklahoma. The Virginia strawberry is a small, rather stout, dark-green, hairy herb growing from a thick rootstock which sends out long, stout runners. The leaves, consisting of three thick, broadly oval, toothed leaflets, grow directly from the rootstock, the leaf stems being erect and from 2 to 6 inches long. The flowers and fruit bear much resemblance to the cultivated strawberry, but the fruit is much smaller. prev: Upland Cotton. Gossypium hirsutum L.
next: Wahoo. Euonymus atropurpureus Jacq.